Greetings, and welcome to the final day of Chocolate, Grains and Grasses Theme Week. When I was small, my pediatrician thought I was too thin. "You need to eat more cookies and cake," she advised. I'm no longer underweight, but today I'm belatedly honoring the good doctor's advice as I sample the last of several chocolate cookies, cakes, cereals and other items this week. Earlier this year I ran a similarly themed Chocolate, Grains and Grasses Theme Week, which also included gluten-free chocolate items made with rice, corn, oats and quinoa (instead of wheat or barley). This was a fun part two. 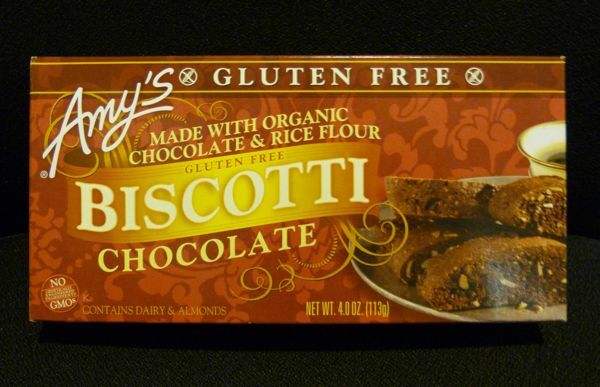 I can't think of a better way to conclude this week than with a trio of gluten-free Chocolate Biscotti (cookies) from Amy's (Santa Rosa, CA). 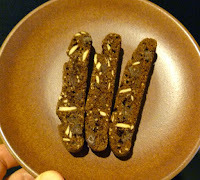 These crunchy, gluten-free biscotti (cookies) were chocolatey good. Embedded almond pieces added pleasant nutty flavor and texture. And a blend of organic brown rice flour, organic oats, almond flour, butter and other ingredients did a fine job of replacing traditional wheat-based flour.